So we were driving along this nice country road on our way back from Ohiopyle. All of a sudden I see this giant ruin that makes absolutely no sense. Naturally I had to pull over and check it out. It sorta looked like a bridge pier, but the hill on the other side of the creek was much too steep. This little pier is in the middle of the creek, and the placement did not make much sense. Knowing southwestern Pennsylvania, my only educated guess is that this had something to do with a coke oven or early heavy industry. Here is a photo of an old furnace from that time period. Still not quite a match though. At this point while I am taking the pictures, I was getting more and more puzzled. The ruins really did not seem to make any sense. The construction of the piers and wall are a mix of concrete, boulders, and brickwork. And there is another pier on the other side of the creek. The biggest piece is this large wall. It seems to be hanging on by a thread and on the verge of collapse. The wall seems to be held up with giant logs with steel rebarb pointing out of them? This is flat out bizarre. Brick and concrete construction. 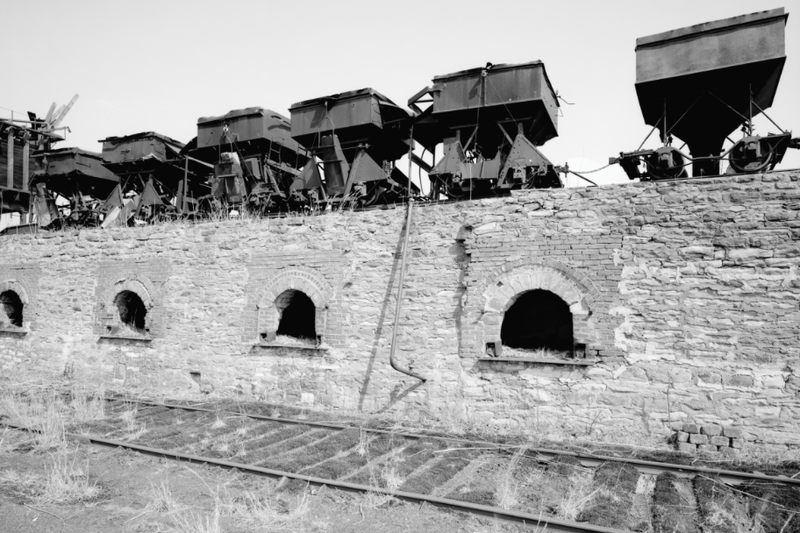 This looks similar to the old bee-hive coke ovens, but I am not seeing a place where the chimneys could come out. I am not sure how this wall is still standing. I never saw anything quite like this. I am not sure if this is some sort of temporary project to hold up the wall, or if this is how it was originally. Talk about a strange relic! Now this is located about a hundred yards diagonally from the creek and slightly uphill. 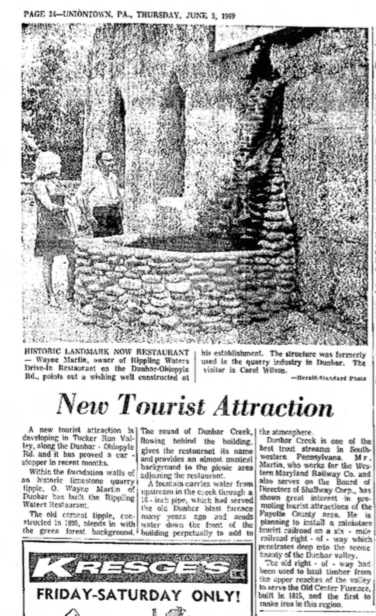 With some research I found that the creek remnants were repurposed into a restaurant in 1969, into the Dunbar Rippling Waters Drive In. The only thing I can find is that this was really short lived, having closed in the early 1970s. This article states that it was built in "the foundation of a historic limestone quarry tipple." This tipple dates back to 1895. This helps make sense of it now. It also states that the restaurant utilized a fountain that flowed from a pipe upstream that once served the old Dunbar blast furnaces. With a little more digging, I have found these images from the Dunbar Historical Society, fully answering the questions. The spot up the hill was the foundation for one of the buildings from the Bluestone Operation that was once here, as was the spot where the restaurant is. The first photo is of the structure that was up the hill. The second photo shows the Rippling Waters Restaurant, and clearly demonstrates that the restaurant was built into an identical foundation to the other Bluestone Building. The Rippling Waters Restaurant was a repurposing of one of the foundations from one of the remaining buildings. 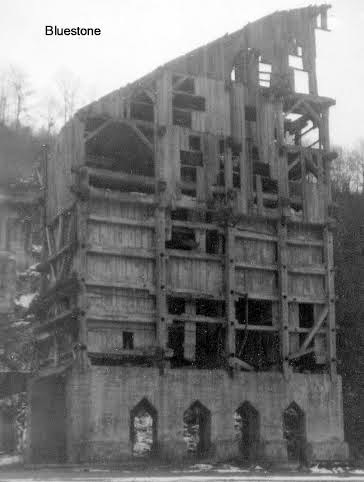 The Bluestone Quarry buildings sat in ruin for decades after a huge flood swept through and destroyed the operation. This article from 1912 talks about the flood that caused devastation to the Bluestone Quarry and the town of Dunbar. So mystery solved! Digging for information about things like this always fascinates me.